City Monday morning for taking part in the inauguration ceremony marking the start of commercial operations of the Rs 1,000-crore first phase manufacturing unit of Mondelez India Foods Pvt., Ltd., On his arrival at helipad, the Chief Minster was given a rousing reception by Mr. C. Sriniraju, Chairman, Sri City and Mr. Ravindra Sannareddy, Founder Managing Director along with Sidharth Jain, District Collector, Chittoor. 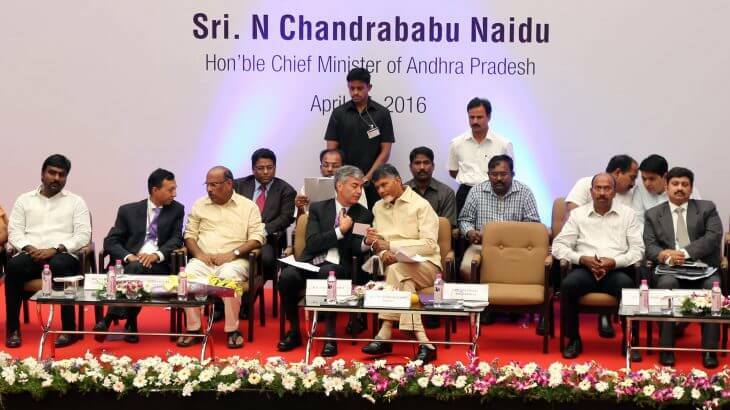 The colourful event took place in the distinguished presence of Mr. N. Chandrababu Naidu, Mr. Daniel Myers, Executive Vice President, Integrated Supply Chain, Mondelēz International, Mr. Maurizio Brusadelli, EVP & President, Asia Pacific, Mondelēz International, and Mr. Chandramouli Venkatesan, Managing Director, Mondelez India Foods Private Limited and several other dignitaries. The multi-category food campus, spread over 134 acres, will operate state-of-the-art Lines of the future and follow High-Performance Work Systems to drive production efficiencies, save energy, reduce emissions and promote community involvement. The entourage of the Chief Minister included Mr. B. Gopala Krishna Reddy, AP Minister, Mr. T. Aditya, MLA, Satyavedu, Mr. Krishnaiah, Chairman, APIIC, Mr. Kartikeya Misra, Director, Industries and a host of senior State Government officials.